Norwalk Reservoir Norwalk Reservoirs 1-2-3 are in Huron County. The reservoirs total 159 acres with 5 miles of shoreline. This reservoir is in Ohio Division of Wildlife District Two(2). 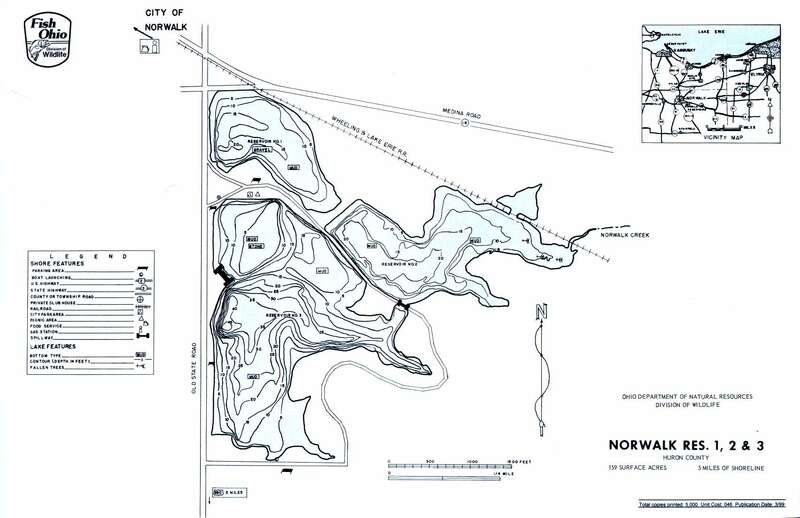 Location The Norwalk Reservoirs are located just southeast of the city of Norwalk at the corners of State Route 18 (Medina Road) and Old State Road and approximately two miles east of State Route 250. Distance from Major Cities Approximately 15 miles south of Sandusky. Approximately 50 miles west of Cleveland. Approximately 90 miles north of Columbus. Approximately 60 miles southeast of Toledo. Fishing Opportunities Norwalk Reservoir #1 is not stocked and not recognized for its fishing. Reservoir #2 is stocked with *Catfish. Reservoir #3 is stocked annually with *Walleye *Saugeye. The reservoirs also contain *Largemouth Bass *Bluegill *Crappies *Northern Pike. Boating Information There is an electric motor only restriction on all of the Norwalk Reservoirs. You can hand launch your small boat where you wish (as long as you're safe!). The reservoirs are closed at night.